Reed Exhibitions Japan Ltd. will be holding BATTERY JAPAN 2019 - Int'l Rechargeable Battery Expo from Feb. 27 at Tokyo Big Sight, Japan. Reed Exhibitions Japan Ltd. will be holding Japan's largest PV industry shows, PV EXPO 2019 and PV SYSTEM EXPO 2019 from Feb. 27 at Tokyo Big Sight, Japan. The two shows are expected to attract 400 exhibitors including 90 new comers and along with other concurrent shows, 70,000 trade visitors from 75 countries. This effort enables distributed energy developers to run energy storage simulations and financial analyses on Energy Toolbase, based on the use of AMS's energy market software. 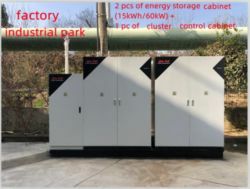 Flex provides GenCell the expanded production capacity to manufacture and deploy its backup and primary power fuel cell solutions at scale. Flex will start producing GenCell fuel cells at its manufacturing facility in Ofakim, Israel, with other production lines set to be opened across the globe in the future. In the period of 11-14 March 2019, ADS-TEC, the Nuertingen-based battery specialist, will be a gold sponsor in Duesseldorf and will be presenting its wide range of products for private homes, industry and infrastructure as well as its leading HPC fast charging technology for E-mobility at Stand E18 in Hall 8b. The system can be ordered from ADS-TEC as of now! Falling feed-in tariffs for solar power are prompting many operators of PV systems to explore how best to make use of their self-generated power in the future. That goes for smaller systems in private homes and for larger plants in industry and agriculture alike. Today Go Electric announces the release of Hive, a UL-certified microgrid-enabled switchgear product that pairs with its energy storage system to allow the company to offer a more turnkey, increasingly simplified microgrid for commercial and industrial facilities. Smart energy monitoring manufacturer Smappee has debuted its new energy management system Smappee Inifinity at this week's E-World 2019 in Essen, Germany. Tailored for Energy Service Companies (ESCOs) and OEM customers, Smappee Infinity provides in-depth, real-time energy insights to make informed and impactful decisions on energy use.